MIAMI -- You can spend an entire basketball game marveling at Pelicans forward Anthony Davis, his beach-umbrella wingspan making him impossible to get around at the rim and on the perimeter, his relentlessness on the boards, his combination of ballhandling and shooting skills quickly catching up with the rest of his natural abilities. Heck, Erik Spoelstra calls him a "David Robinson-type" without blinking. Yet you can spend that same amount of time wondering why Davis' Pelicans aren't significantly better than they are. Hector Gabino/El Nuevo Herald/MCT/Getty Images Anthony Davis was sharp in the first half, but stopping LeBron and the Heat proved to be too much. Yes, they were without Ryan Anderson on Tuesday against the two-time defending champs, but the suddenness with which a 54-43 New Orleans lead in the third quarter turned into a 107-88 Heat win almost says as much about the Pelicans' underachieving nature as it does the Heat's ability to turn it on. There seems to be little reason why New Orleans can get 16 points, 10 rebounds, three steals and two blocks from Davis in the first half and not have enough competent assistance to even make it a close game in the second half. While the Pelicans appear to play big-to-big basketball well, which would help explain why Jason Smith would get almost twice as many shot attempts (11) as an All-Star point guard Jrue Holiday (six), there's very little else there to complement Davis. The two prized offseason backcourt additions -- Holiday and Tyreke Evans -- spend more time dribbling indiscriminately in the half-court set than creating plays. The two combined for 17 points, eight assists and six turnovers in 51 minutes of play Tuesday. It's frustrating, not only for those who expected much more of the Pelicans this season, but also for Davis and his teammates. They essentially watched the Heat turn the game around with a 25-7 run in the third quarter, putting up little resistance. And the explanations coming from the New Orleans side don't speak well for coach Monty Williams. "We lost some of that fight when they took the lead," Davis said. "The momentum changed and we didn't remember our defensive assignments, or whatever." "Or whatever" could be the title of New Orleans' defensive strategy in the second half, as the Heat shot 59 percent in the final 24 minutes and outscored the Pelicans 64-39. Given how well Davis played (he finished with 22 points and 12 rebounds in 41 minutes), that second-half collapse was actually difficult to accomplish for New Orleans. "He's got everything," Chris Bosh said of Davis. "He's always moving, for one. He jumps at every offensive rebound [opportunity]. And he's just talented. You can tell he's more confident in his jumper. They're running plays for it. They give him space for jumpers and catch-and-go. They're running a lot of offense through him, and as time goes on, it just builds your confidence." Only it was Bosh building confidence in defending Davis as the night went on. The Heat had started with Rashard Lewis -- still starting in place of Shane Battier (quadriceps) -- on Davis, but switched to Bosh as the primary defender in the second half. It played a large role in Davis putting up just six points and two rebounds after halftime. But frankly, Spoelstra and the Heat have grown used to that type of shut-down ability from Bosh, the regularly underrated All-Star. "It's always a team concept with us, but CB is an elite, elite defender in this league," Spoelstra said. "He's proving it every single night. We see it. He anchors our defense. We've talked about all the pick-and-rolls you have to defend on a night-to-night basis, recovering back, challenging jump shots, challenging in the post. He's having as good a defensive year as a big has had recently." Bosh says he's been improving as a defender every year since arriving in Miami in 2010, but last season's NBA Finals against the Spurs was particularly helpful in raising his confidence. "Being in the Finals so many times, sometimes you're on an island," Bosh said. "Especially after that last series against Tim Duncan down there. Every single time, every single possession, especially down the wire, I had to D up, and I think I kind of turned the curve a little bit mentally, and those things kind of helped me out. "I'm not saying I'm going to stop a dude every time, but just make it as tough as possible." On Tuesday, it was Davis who recognized Bosh's defensive abilities. And watching the two of them clash was almost like watching a version of the old Chris Bosh against the current Bosh. Davis, like Bosh used to, is racking up impressive numbers on an uneven-performing team where 22 and 12 can't even keep you close against an elite opponent. Meanwhile, Bosh is finding spots to make his impact -- getting fouled shooting a 3 at the end of the half, hitting a critical third-quarter 3, keeping the floor spread while playing alongside Chris Andersen -- yet finishing with the less-impressive 12 points, nine rebounds and the win. Now, he simply chooses to make more of an impact defensively. "If I can't get that many shots, he can't either," Bosh said. Of course, when the Heat win, you can usually find a handful of players to shower with praise, and Tuesday's could've gone toward LeBron James (32 points), Dwyane Wade (22 points, eight rebounds, eight assists), Andersen (7-of-7 for 15 points) or Bosh. But it's hard to ignore that empty feeling the Pelicans leave you with. The feeling that a team featuring only one victory against a winning team all season (Portland) will offer. The feeling of sympathy you have for Davis when his All-Star caliber season isn't amounting to much team success. "We know we have it," Holiday said. "We just need to put it together for 48 minutes." Actually, all we know so far is you have Davis. After that, the rest of "it" appears largely undiscovered. MVP: Tim Duncan. It's gotta be the Big Fundamental, who put up a 24-17-4-2 line in the win. Duncan was involved in every part of the offense, especially late, and anchored a defense that was missing Tiago Splitter. Defining moment: In what should've been a comfortable victory for the Spurs after a Marco Belinelli 3 to put San Antonio up 96-84 with 1:59 left, the Grizzlies reeled off 12 straight points to tie the game and then Mike Conley forced overtime with a bucket as the fourth quarter ended. X factor: Was that the James Johnson game? Johnson came off the bench to score 15 points (and put up 18 shots), five assists and four rebounds against the Spurs. He even hit a big bucket late in overtime before Manu Ginobili scored the game winner. Turning point: Normally strong coming out of the break, the Blazers managed just 13 points in the third quarter. That was ... not really as close as the final score suggests: While the Blazers refused to give in and found luck late, a few boneheaded mistakes by Sacramento tightened what should've been a blowout. MVP: Roy Hibbert. With 22 points on just 12 shots, eight boards and three blocks, it's hardly surprising the Raptors were able to pull out last week's game with Hibbert limited to 21 minutes. Defining moment: In the second, Kyle Lowry missed three straight freebies, something a 78.7 percent shooter would do less than once in 100 tries. It was indicative of the Raptors fighting hard but lacking execution on Tuesday. That was ... a sign of progress. Yes, the Raptors have now dropped two straight decisions, but they've been at Miami and Indiana, by a combined 12 points. This team might very well be for real. MVP: The Heat toyed with the undermanned Pelicans for much of the first half, but LeBron James took over in the third quarter and Miami never looked back. LeBron had 16 of his 32 points in the third, and was a huge part of the defense that limited to New Orleans to just 39 points in the second half. Turning point: With three seconds left in the half, the Pelicans had the ball and were up by nine. 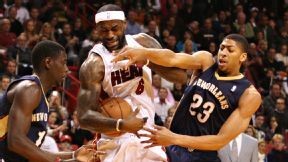 Tyreke Evans was called for a carry and then Anthony Morrow fouled Chris Bosh on a 3-point attempt. Bosh proceeded to sink all three free throws, and instead of the Pelicans potentially being up 11 or 12, they went into the half up just six. That was ... a career high: With Ryan Anderson out for the Pelicans, Anthony Davis played a career-high 41 minutes, but it just wasn't enough. The 20-year-old sophomore sensation helped the Pelicans surge to the lead and finished with 22 points, 12 rebounds, 3 steals and 2 blocks, but with no real perimeter threat on the roster, the Pelicans didn't have enough around him to beat the Heat. MVP: On their first night without franchise paragon Luol Deng, the Bulls rallied behind an emotionally charged Joakim Noah, who finished with 14 points, 16 rebounds and six assists. He buoyed Chicago's passing all night, as they finished with 26 assists on 36 field goals. Defining moment: With Phoenix trailing Chicago by five points in the fourth quarter, Tony Snell nailed two 3-pointers in a row to put Chicago up by double-digits. The Suns would attempt to rally but they never recovered. X factor: Noah stole the show, but Taj Gibson, who started in the place of the injured Carlos Boozer, was Chicago's most consistent scorer with 19 points and 10 rebounds. As a beneficiary of Noah's passing, he set the tone down low. MVP: Sans Carmelo Anthony, the Knicks hit only 20 of 57 shots and 3-of-19 from 3-point range. That speaks as loudly as his 34 points, and the three straight treys he sank during the 15-0 run in the third that gave New York the lead for good. X factor: With Tyson Chandler sitting due to an upper respiratory infection, Kenyon Martin played aggressive defense, slung a number of nifty passes from the high post and tipped out the rebound off a missed Raymond Felton free throw that clinched it. Defining moment: Remember when J.R. Smith tried to untie an opponent's shoelaces at the line on Sunday? Yes, he got caught and called out for it and yes, he appeared to do so again tonight. Like the parable of the scorpion and the frog, he remains ... J.R. Smith. MVP: Dirk Nowitzki with 27 points, seven rebounds and four assists. The Mavericks were unable to shake the Lakers until late in the fourth quarter, but Dirk kept them ahead for most of the game with a variety of drives and rainbow jumpers. X factor: Monta Ellis contributed 16 points and nine assists. It was Ellis who led the final close-out of the Lakers, scoring 10 straight for the Mavericks while Dirk got his usual fourth-quarter rest on the bench. That was ... theft. The Mavericks backcourt of Jose Calderon and Monta Ellis combined for 10 steals. As a team, Dallas took the ball from the Lakers 17 times. Gordon Hayward, Jazz: When your team has the second-worst record in the West, it's nights like these that light the way to a brighter future. 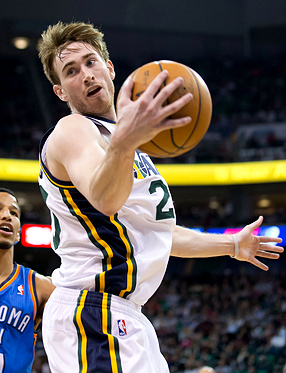 Hayward sank 13 of 16 shots en route to 37 points, 11 rebounds and seven assists in a 112-101 win over the Thunder. The reigning Eastern Conference player of the week clearly could not see past all the bouquets being tossed his way. Young missed all seven of his shots and didn't score in 22 minutes of a 111-93 rout by the Cavs. "We discussed it, and I'll leave it at that." -- Bulls coach Tom Thibodeau, on pre-trade discussions before Chicago decided to deal away his All-Star forward Luol Deng. Russ Isabella/USA TODAY Sports Gordon Hayward scored a career-high 37 points, including Utah's final 17 points, to overcome Kevin Durant's 48 points and lead the Jazz to a 112-101 win over Oklahoma City. The Warriors won their tenth consecutive game on Tuesday, against the Bucks in Milwaukee, for their longest winning streak since December 1975. The only current NBA team that has gone longer without a 10-game winning streak is the Wizards, who have never had a double-digit winning streak in their 53-year history (since entering the league in 1961-62 as the Chicago Packers). Four other teams who entered the league after December 1975 have never won ten straight games (the Magic, Raptors, Grizzlies and Bobcats). David Lee scored 22 points, grabbed 18 rebounds and made 10 of 12 shots on Tuesday and during the 10-game winning streak he's scored 226 points with 104 rebounds and a 61.4 shooting percentage. Lee is the first player to score 200 points, grab 100 rebounds and shoot 60 percent from the floor while playing every game of a 10-game winning streak by his team since Shawn Kemp had a run like that (206 points, 117 rebounds, 63.2 field goal percentage) for Seattle in February 1996. MVP: Gordon Hayward put up a career-high 37 points and added 11 rebounds and seven assists for the Jazz. Even better, he singlehandedly thwarted the OKC run by scoring Utah's final 17 points of the game. Defining moment: After the Thunder got the Utah lead down to 5, Hayward hit two consecutive 3s for the Jazz with three minutes left to rebuild the margin with the Jazz crowd going crazy. X factor: Sure, his team lost. But Kevin Durant scored 48 points tonight for his short-handed Thunder squad, and led a 34-15 Thunder run that cut the Jazz lead from 24 to 5. MVP: David Lee. Lee finished with 22 points on 10-of-12 shooting. He punished the Bucks inside, grabbing 18 rebounds and making all six of the shots he attempted in the paint -- a clever assortment of bank shots, hook shots and putbacks. LVPs (tie): Ersan Ilyasova and Larry Sanders. Despite Ilyasova's 20 points, the Bucks' frontcourt duo got outrebounded by the Lee/Andrew Bogut tandem by a 30-12 margin. To make matters worse, Ilyasova played poor defense and Sanders only made two of his (mostly ill-chosen) 10 shots. That was ... not the norm: Steph Curry and Klay Thompson combined to shoot 3-of-17 from 3-point range. Despite the long-range misfires (and Curry's seven turnovers), the duo managed to score 15 points apiece in the Warriors' 10th consecutive win. MVP: Randy Foye. The veteran guard finished with a season-best 23 points. Foye did most of his damage from 3-point range, hitting 7-of-12 from downtown to lead a dominant offensive performance by the Nuggets. X factor: Effort. Denver came out aggressive from the opening tip and kept its foot on the gas as they piled up their second-highest point total in a game this season. Meanwhile, the Celtics gave up countless uncontested 3-pointers and dunks, looking disengaged for most of the night. That was ... foolish. Jared Sullinger was ejected in the third quarter after being whistled for two flagrant-1 fouls on back-to-back plays. The power forward now has five flagrant-1 fouls on the season, meaning he will earn a one-game suspension after his next flagrant foul. MVP: C.J. Miles had a night to remember. The veteran hit eight first-half 3-pointers, finished with a franchise-record 10, and, when the final buzzer sounded, had a career-best 34 points. He'll tell his grandchildren about this game someday. And they'll be bored. LVP: Thaddeus Young, the reigning Eastern Conference Player of the Week, entered Tuesday red-hot, averaging 25.6 points in his previous eight games. Then he did this: 0 points in 22 minutes on 0-for-7 shooting. Teammate Evan Turner, who mustered just four points on 13 shots, wasn't much better. X factor: Michael Carter-Williams was impressive in defeat, scoring 33 points, the most of his young career, and turning the ball over just once. Start planning on where to put that Rookie of the Year award, kid.